Like many young Aboriginal men, Jack Buckskin grew up not knowing his traditional language and culture, as it had been driven almost to extinction a hundred years ago. Living on the edge of Adelaide, a life-changing event set him on a new path. The traditional language of Kaurna country in South Australia's Adelaide Plains is thought to have disappeared about 100 years ago. But thanks to research by linguists, a revival is underway. 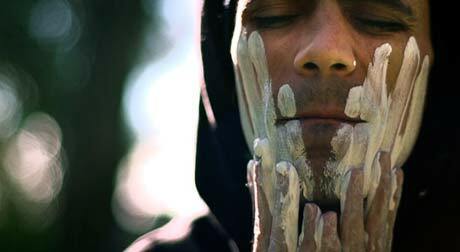 Jack Buckskin started learning Kaurna in 2006, and is now the only Aboriginal person to teach it in Adelaide. Now Jack is on a mission to renew the Kaurna language and culture, and teach it to as many people as he can in his lifetime. As his Uncle Steve says, "People who are still very strong in their culture walk differently." And Jack Buckskin is no exception to this. Still image from the movie Buckskin by Dylan McDonald. Buckskin is in English and Kaurna (Aboriginal language). Buckskin is McDonald's first documentary.